HDPE durAstatic bottles are dissipative and are designed to protect your static sensitive printed circuitry, these bottles contain no migratory additives - which reduce the chance for contamination from the bottle. 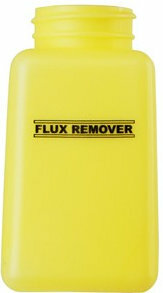 Flux Remover labeled bottles are embossed with an ESD protective symbol, and are available in gree, blue, orange, and yellow colors. Menda has also released an additional four bottles. These bottles are available in the same colors and sizes as the previously mentioned - however, they also include the Menda One-Touch Dispensing Pump. 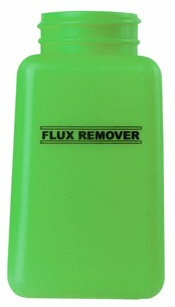 This Flux Dispensing Pump (used for many other chemicals) dispenses approximately 2cc of liquid per pump. With the Menda One-Touch Pump there is an opening in the center of the dish to allow the liquid (in this case flux) to seep back down into the bottle. It is designed as a "dish-type" and allows for one-handed operation. 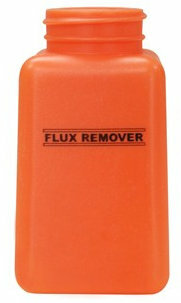 All Menda Flux Dispensing Bottles are Made in the United States of America and Menda accepts no substitutes. 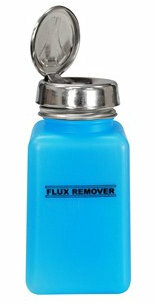 To shop Menda Flux Dispensing Bottles and other Pump Dispensers click on the links provided. *Additionally, to ensure compatibility with the Menda Flux Dispensing Bottles (6 oz) - pumps that offer a 6 oz stem should be selected.